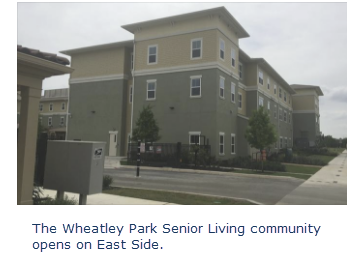 ​​​​​ SAN ANTONIO – The Wheatley Park Senior Living community phase two is open. ​The new community, on 910 North Mittman St., features 80 one- and two-bedroom apartments. The project is just phase two in the four phase Wheatley Choice Neighborhoods Initiative, which will eventually create four new affordable housing developments on the East Side. The first phase, the 215-unit East Meadows apartment complex, which was completed in 2016, is currently 99 percent occupied. Phase three, the 119-unit East Meadows II​, will begin construction in June 2018. ​See also: San Antonio-New Braunfels Multifamily Market Research.